The PC/GNA condemns forced entry by Breish into LIA HQ. Breish denies using force (Photo: PC/GNA). 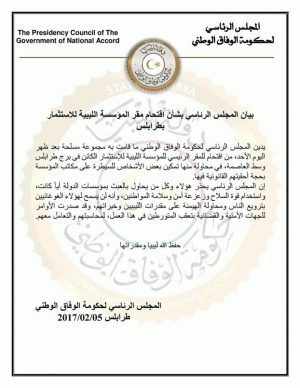 Abdulmajid Breish, who had been previously ousted as chairman of the Libyan Investment Authority (LIA), made a return to its Tripoli headquarters yesterday. Breish entered the LIA HQ located at the Tripoli Tower yesterday afternoon armed with a local court decision which overturned the decision of Faiez Serraj’s Presidency Council/Government of National Accord (PC/GNA) which had appointed a caretaker board and chairman under Ali Mohamed Hassan. The PC/GNA issued an immediate statement yesterday condemning Breish, without naming him, for having stormed the LIA HQ by force and promised to take legal action. However, Breish himself has issued a statement denying that he had used force to enter the building. An employee at the HQ today told Libya Herald that Breish had not stormed the HQ using militias, as many social media had been reporting. The source said that Breish was accompanied by unarmed members of the Nawasi brigade acting as Justice police executing on behalf of the court. The source said Breish gathered all the staff at around 2.30 and spoke to them informing them that things will continue as they were and the LIA will continue operating as normal. In fact, the source said he witnessed less militias milling around now than he used to during Hassan’s term. He also accused Hassan of making new appointments to the LIA which were questionable. Meanwhile, the saga of various power and political centres’s power struggle to control the LIA, and Libya’s institutions in general, continues in the absence of a strong, legitimate government, legitimate centralized security apparatus and strong independent judiciary. 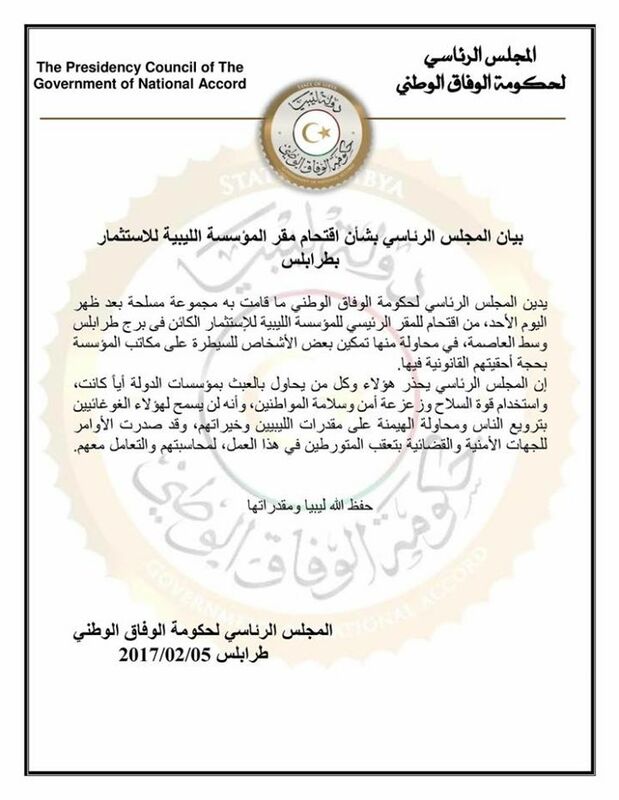 The incident also continues to highlight the tension between international legitimacy and recognition conferred upon the Serraj PC/GNA by the international community and the United Nations, and the lack of domestic legitimacy and recognition.